As I walked around savoring the richness and beauty of the Egyptian collection at the Metropolitan Museum, I came across a wooden statue of a woman’s head. The craftsmanship was magnificent. The eyes were the most entrancing feature of the statue. Each time I attempted to walk away, I felt as if the eyes were calling me back. I was held captive by her gaze. When I finally broke away and moved to another room, her captivating eyes became a fixture in my mind. After a few minutes, I gave in and went back. Upon leaving the museum, I realized that I did not know the name of the statue and/or the significant role it played in ancient Egypt. It was too late. I could not go back. I decided to return another day to attain the information. At home, I continued to think about the statue. “Why didn’t I write down her name?” I asked myself. Out of nowhere, a name came to me. It was Hathor. “Could this be her name?” I went immediately to the computer and enter her name on google image. There she was. It was Hathor with and without a headdress. She was an Ancient Egyptian Goddess. The information above was fine. However, I needed more. I wanted to know why I was so intrigued by Hathor Spiritual Goddess. What connection did I have with this Goddess? Did I worship Hathor in another lifetime? What was the mystery that was hidden deep inside me? These and other questions kept reappearing in my head. One day, while in a semi meditative state, I began looking around my living room as if looking for some unknown item. Everything was a blur except for certain items that appeared to stand out. To my amazement, they were items pertaining to Hathor. The Ancient Egyptian Goddess had been in my home for years, and I did not know it. During my visits to Egypt, I would purchase items without much thought to its significance. I would see something I liked and buy it. On one of my visits, I became obsessed with obtaining a statue of Anubis- a jackal headed ancient Egyptian god associated with the afterlife and mummification (see picture above). I searched everywhere but to no avail. Instead of Anubis, I came back home with a statue of Hathor. Although I am quite sure I was told the name, it must have vanished from my memory for I never associated the statue with the Goddess Hathor. 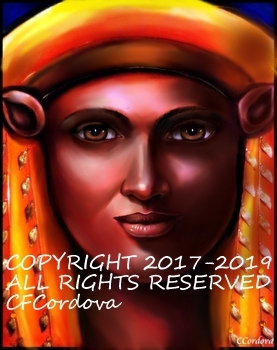 One day, while attending a past-life workshop, the Hathor mystery was revealed. During a past-life regression session, I was taken to a place in Ancient Egypt. I saw myself as an Egyptian male dressed in white garbs. I was a priest responsible for all rituals performed for an Egyptian Goddess. After the regression, I began revealing the details of my experience. Suddenly, I realized why the museum statue of Hathor had such a strong impact on me. Furthermore, why I purchased various Hathor items throughout the years without much thought. To my surprise, it was Hathor who I saw during my past-life regression. 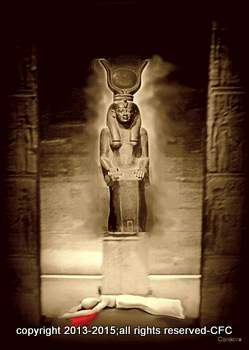 I once worshipped the Goddess Hathor. I have learned much from this experience. There are things that our physical being cannot comprehend, but our incarnate spirit is fully aware. Occasionally, you will come across something that will trigger a past life memory. Instead of dismissing it, embrace it and see what unfolds.